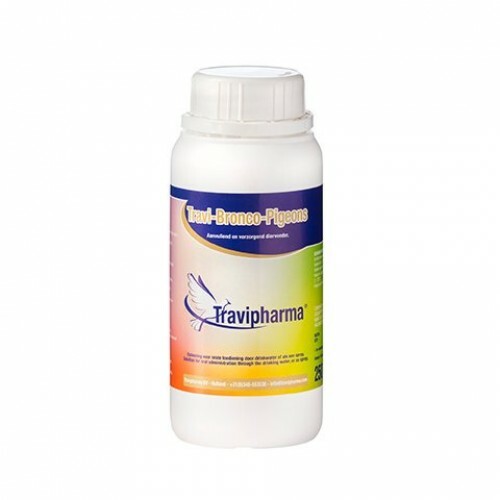 Travi-Bronco-Pigeons by Travipharma is a solution for oral administration by drinking water and Spray, totally natural product, helps to clean and purify the respiratory tract, mucus, ideal for a healthy breath and clean throat. - Pink throat without mucus. White nostrils Clean heads and dry eyes. - Positive influence on heat stress. - It has an anti-inflammatory and anti-stress effect. It stimulates the appetite. Dosage: Shake before use, refresh daily. Drinking water: 2 ml in 10 l of drinking water, for 4-5 days. Spray: 250 ml per 10 l of water. Spray 3 times a day at 6-hour intervals, for 3-4 days.